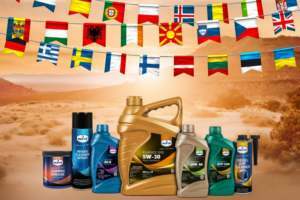 Eurol CVT 1304 | Eurol B.V.
A fully synthetic transmission oil for the lubrication of modern Continuously Variable Transmissions. It can be applied in all metal-belt CVT’s, which are mentioned under Performance Level as it offers optimal protection of the transmission under every condition and prevents wear at the metal-metal contact points on the belts and pulleys. The oil is formulated to prevent air entry and foam building in order to guarantee optimum lubrication and a durable quality, even under ongoing pressure.